Santos expressed the warning in the middle of a three-day national economic shutdown ordered by the ELN and a spike in cop-killings allegedly carried out by guerrillas belonging to the group. According to the Ombudsman’s Office, the rebels carried out 35 attacks in the first two days of their “armed strike,” targeting transporters ignoring their order to end commercial activity, but also energy infrastructure and security forces. Additionally, three policemen were allegedly assassinated. The government announced peace talks with the ELN in June 2014, five days before Santos’ successful reelection bid, but has since failed to formalize these talks. In the meantime, the ELN has stepped up guerrilla attacks to increase their leverage at the negotiation table. The move spurred social media platform Twitter to close all ELN accounts. 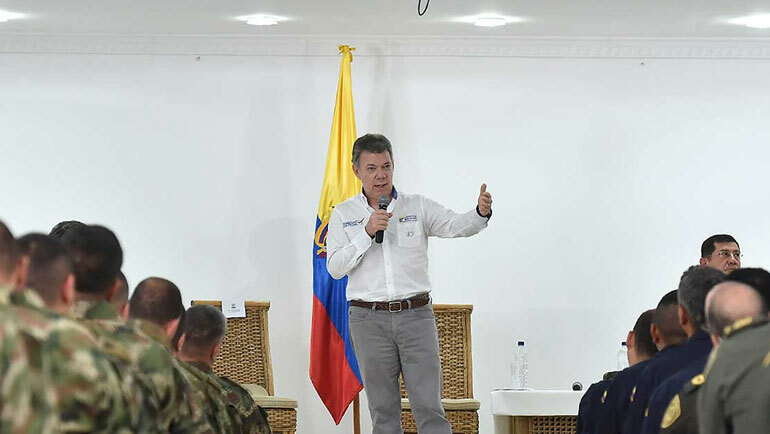 Santos met with his defense minister and the commanders of the security forces in the Caribbean coastal city of Santa Marta on Tuesday to figure out a response to the wave of guerrilla violence. The president’s website claimed that — even though the rebels were able to carry out dozens of attacks — “the security forces have been able to frustrate 90%” of attacks. “Our security forces have been and are prepared to contain acts of terrorism, especially when they are against civilians,” a claim seriously discredited by reality. According to the ombudsman’s office, the ELN was able to carry out attacks in nine of the country’s 32 provinces, seriously disrupting public security particularly on highways. The group has been waging war with the state since 1964 initially inspired by the Cuban revolution and the religious-leftist liberation theology. The guerrilla group, however, has since become a major player in Colombia’s criminal economy, using kidnapping, drug trafficking and extortion to finance its 51-year-long war.